Whether you’re traveling to a city for the first time across the country or hiking in a new part of the world, it can easily be spoiled if your tooth is in constant pain. With your local emergency dentist thousands of miles away, it can really put a damper on your vacation. Luckily, there are ways to treat yourself without cutting the trip short. Here’s what you should do if the following occurs while you’re traveling. If the pain appears while you’re still in the plane, chances are you’re experiencing air pressure imbalances. Air that passes through a cracked tooth, cavity, or filling will eventually expand, causing pressure while flying. In this case, wait until you land to confirm there isn’t an underlying condition. In the event the pain does not go away after landing, head to a bathroom with dental floss in hand. Examine the affected area and confirm that no food debris is stuck in between your teeth. This can easily occur for many foods, such as nuts, chips, or other starches. If this doesn’t work, you may need to find a local dentist through your hotel management, local guide, or other information center in the area you’re visiting. Alleviate pain through medications like Motrin, Aleve, and Advil. Pay close attention to external stimuli to see if pain is more substantial then. 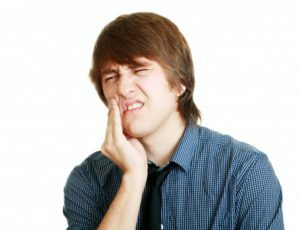 In some cases, tooth pain can actually be tooth sensitivity after drinking hot, cold, sweet, or acidic food and beverages. If the tooth is only partially dislodged, avoid applying more pressure to the teeth by chewing foods on the opposite side of your mouth. The best place to keep your tooth is inside the socket to preserve it. If the tooth is completely knocked-out, pick it up by the crown only and rinse off any dirt that may have collected. Avoid touching the root or removing any tissue that’s still attached. If you notice dirt on the root, gently rinse it with cool water before attempting to place it back into the socket. Visit a local pharmacy or grocery store for clove oil. When mixed with warm water, it can be applied to your socket to reduce inflammation and kill bacteria. If you can’t place the tooth back into the socket, place the tooth in a container of milk, saline solution, saltwater, or saliva and locate a dentist right away. Handling dental emergencies is easier when you have a plan to go from. To learn more advice on handling emergencies abroad, schedule an appointment with your emergency dentist today! Dr. C.J. Landry earned his Doctor of Dental Surgery degree from the LSU School of Dentistry. With over 30 years of experience practicing and completing thousands of hours of continuing education, your dentist is more than equipped to handle any dental emergency that’s thrown at him. To learn more about his practice, contact him through his website.